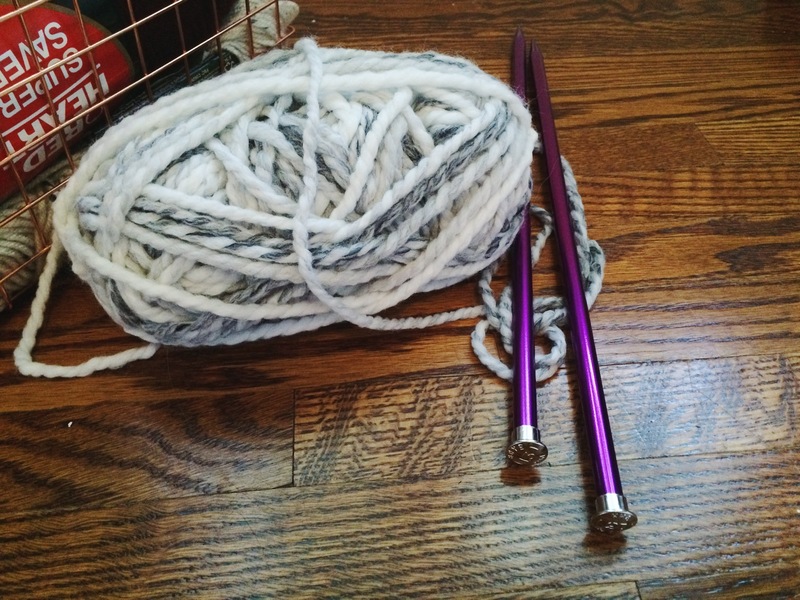 Knit: Pillow Cover Part II – Yarn, Things, Etc. Well, here it is — yet another pillow cover. I couldn’t stand looking at my other IKEA pillow after my last post, so one week later and I have a new cozy pillow to add to my collection. And I mean collection. My double bed is half throw pillows at this point. This cover is very similar to the one in my previous post, but this time I used thick yarn, wide needles and no buttons. 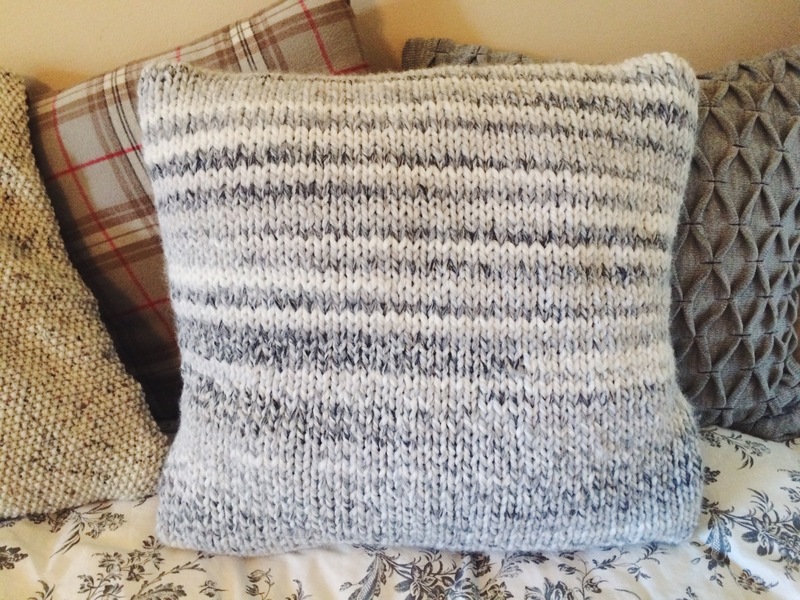 The last pillow, while completely worth it, involved weeks worth of knitting. Clearly I wanted a quick project. I’m absolutely in love with this Marble Lion Brand yarn. I didn’t really have any expectations when I started working with it, but it’s so thick, fluffy and also creates a nice stripe effect. Here is the finished pillow with a few others (the two behind are store bought and the pillow to the left was my last project) — obviously I love mixing patterns. 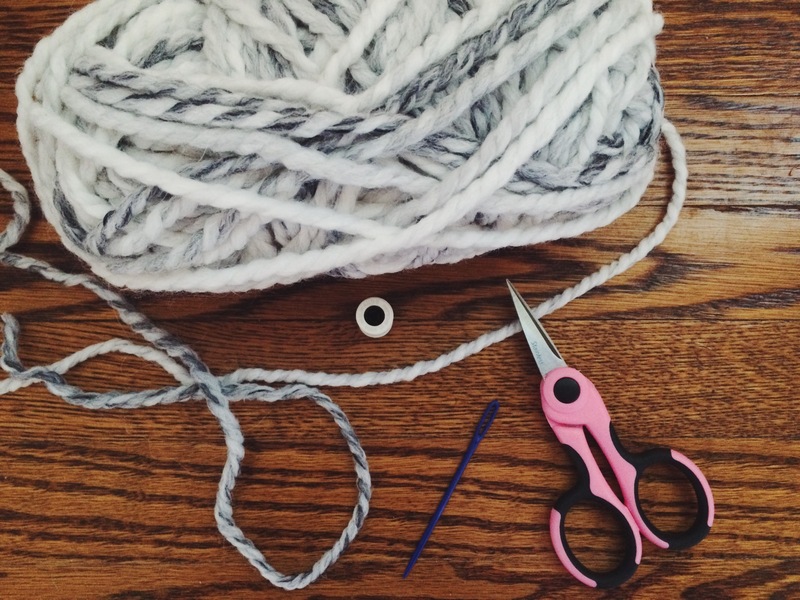 I always say this, but I feel like it’s a necessary disclaimer: I am not a professional knitter, just someone who enjoys experimenting with new projects. The “pattern” below lists the steps I followed, but there are fantastic resources out there for stitch tutorials and well-constructed patterns. I hope it helps non-the-less! To start, knit a swatch of 5 rows across 10 stitches to determine your total number of cast-on stitches. For my IKEA pillow, which was 20 inches across, I cast on 50 stitches. I could have cast on 46-48 stitches and it should have been fine, but 50 allowed for more room just in case. Rows 1-60: Knit a square piece for the front (1: K across, 2: P across and repeat). Mark the start of row 60 with a stitch marker as the next section will fold around to the other side of the pillow. Row 61-75: These rows will create the envelope “flap” on the back of the pillow. Knit in seed stitch for the last 5 rows to create a solid edge. Rows 1-40: Repeat steps from the front (knit a square piece). This piece will be a bit shorter as it folds in behind the flap of the pillow front. Rows 41-45: Knit in seed stitch to finish and cast off on row 45. Note: You could/probably should add a few more rows here. I was eager to finish and found that there was a bit of a gap between the two sections once the pillow was inserted. It didn’t matter in this case as I sewed the edges together, but you will need to add 5 more rows if you plan on adding buttons. Place the front folded side up (the flap should be facing up), and place the back piece over top purl side up. The two pieces should be overlapping. Stitch around all free edges with your tapestry needle. Turn your pillowcase inside out and you should be left with an envelope shape. Add buttons (see my previous pillow case post) to ensure that it holds together, or sew the opening together — I chose the latter for this pillow.